-Ex Screw Upper (qcf x2+P) will stay in position when it hits. With this change, Joe can’t be punished afterwards when he hits the opponent with it in the corner. -Sliding can be canceled with his Bakuretsuken (rapid P). But not with any other specials. -Hit detection will remain on the opponent after his sliding hits. Again, it can’t be canceled with anything but his Bakuretsuken, but he can go into HD mode from the slide. -Slash Kick (hcf K) can be drive canceled. -EX Tiger Kick (Ex dp+K) comes out faster. Has strong invincibility in the front. Producer Yamamoto says: "He can actually juggle other attacks aside from his Bakuretsuken after his slide so please try them from going into HD mode from his slide and whatnot. Also, his EX Screw Upper has been changed so you can use it in the corner without worrying. He does things a bit differently on a Max Cancel too." The strong yet arrogant Muay Thai practitioner returns to KOFXIII with a very interesting game plan and tricks up his sleeve. Generally, Joe has very good zoning ability and decent normals to compliment his game play. What needs to be understood however is that even though Joe has a lot of strong tools at his disposal, he is not necessarily the easiest character to utilize. Joe relies on the player having very good space and ground control while being able to capitalize on the offensive at multiple ranges. The player can make careful use of his of hcf+K Thrust Kick and his qcf+P projectile to zone around a bit while setting himself up for the advantage. Joe also does an incredible amount of damage when he has a bit of meter available. In fact, Joe actually has a stun combo that can be accessible in high level matches should the player gradually practice such a combo. Another thing to note is that Joe has rather decent reversal options though the player needs to use them in moderation. His DP+D for example has a huge amount of start up but also has an absurd amount of invincibility on the said start up. Thus, DP+D would be considered a good "preemptive" reversal if the opponent starts acting a little too silly at the mid range or if the player combos into it for a high damage drive combo. The Thrust Kick (hcf+K) can be used to draw himself close to the opponent to cover distance and be utilized in high damage combos as well. His hcf+B is relatively safe on block, along with the EX version.Joe is a very powerful character in practice but requires good insight on his ability to zone and make careful use of the ground and neutral game to defeat the opponent. Can start an offense from longer ranges due to how his special moves and DM's are arranged. s. A: 25 damage, chain/cancel-able, hits mid. Nice, quick jab to the chin. Decent range, good for stopping hops and for poking at close range. s. B: 30 damage, cancel-able, hits mid. A slightly toe pointed front kick that aims the the opponents mid-section. Good range, good for poking, and safe on block. s. C: 80 damage, hits mid. An elbow hook that is slightly safe on block. Pushes Joe back on block very close to the range of his s.B. s. D: 70 damage, cancel-able, hits mid. A thrusting knee attack that has more range than it looks. On block, this normal is pretty safe too. far C: 70 damage, hits mid. This punch has great range, good pushback on block, and is safe too. d. A: 25 damage, chain/cancel-able, hits mid. An quick elbow that is safe on block. The range isn't horrible either. d. B: 30 damage, chain-able, hits low. A neutral positioning low kick. Quick and a great starter for his ground combos. d. C: 70 damage, cancel-able, hits mid. Similar to his far C, but in a crouch position. Has slightly less pushback on block than his far C though. d. D: 80 damage, whiff/cancel-able, hits low. A sweep that can be canceled on whiff and on hit. Has a decent range but has bad recovery. j. A: 45(40) damage, hits overhead. A slightly high angled elbow attack that completely misses on some crouching characters. Good for air-to-air though. j. B: 45(40) damage, hits overhead. A short ranged jumping knee that is good for ground-to-air jumps. j. C: 72(70) damage, hits overhead. The punch points downward, which can be good for jump-ins. j. D: 70(68) damage, hits overhead. This kick has a downward angle too which can be useful for jump-in or fadeaway jump-outs. CD: 75 damage, cancel-able, hits mid. A side kick with decent range that can be canceled. Can be used as a poke but just remember to cancel it if it whiffs. j. CD: 90(80) damage, hits mid. Great for air-to-air jumps because of its good horizontal range. It might whiff over the heads of some crouching opponents. GCCD 10 damage, hits mid. Guard Cancel Blowback Attack. Sou Hiza Jigoku = (bf/+C/D) close 101 damage, can be broken, does not cause a hard knockdown. Some knees to the stomach, with the final thrust throwing the opponent far. Hurricane Upper = (hcf+P) - Joe throws an uppercut that sends a hurricane projectile across the screen. Despite looking tall, the projectile can be hopped over. A version is slower and has faster recovery. C is the opposite of A. Both versions will travel to the edge of the screen. Effective when used mid range, A Hurricane followed by Slash Kick or Golden Heel are useful methods for dealing with opponents who roll through or jump over the projectile. (EX) = hcf+AC - Throws 3 Hurricane Uppers in quick succession. Travels through normal fireballs. Each of the three hurricanes can negate an EX fireball. Tiger Kick = (dp+K) - Joe jumps forwards attacking with his knee hitting twice. The initial attack frames will cause the opponent to float allowing for drive cancels. B Tiger Kick has quick startup and quick recovery, but no invincibility. The D version behaves oppositely: slow startup, slow recovery and good invincibility. B is good for combos and D is good for regaining momentum. (EX) = dp+BD - Is the best of both B and D versions. Fast startup, recovery and good invincibility. A high-damage EX that is also good for interrupting the opponent. Invincible frames last until attack frames are over. Can be used to go through fireballs and down the opponent at closer ranges. Thrust Kick = (hcf+K) - A flying middle kick that advances horizontally. Upon hit the opponent is juggleable until hitting the ground making it a good drive cancel attack. 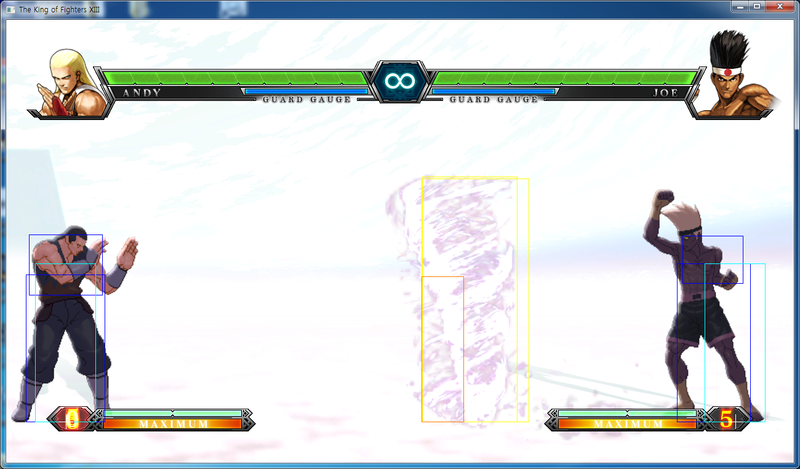 B Slash Kick travels half a screen and is safe on block when you hit with the end of it. D travels and entire screen length, but is punishable on block at any distance making it inadvisable to use. (EX) = hcf+BD - Slower than B, but hit's twice and floats the opponent for followups. Safe on block even close up. Bakuretsuken = [A/C] - Throws a series of rapid punches that can be followed up with a finisher. Minimum number of button presses: 4. No difference between A and C. The finisher motion can be inputted while pressing the button 4 times with one more button press at the end in order to finish with the least amount of punches (4 including finisher). This is a valuable technique for Joe's juggle combos as the finisher leaves the opponent juggle-able. Bakuretsuken can be super cancelled by BHTK only. (EX) = [P] - Moves forwards while performing Bakuretsuken. The finisher is automatically executed. As this move starts up very quickly, it can be used as a counter attack. Floats the opponent relatively high for easy non-cancel follow ups. ie- Ougon no Kakato can be used afterward to juggle without drive canceling. Bakuretsuken Finish = (qcb+P) - Finisher mentioned above. The finisher can be drive canceled. 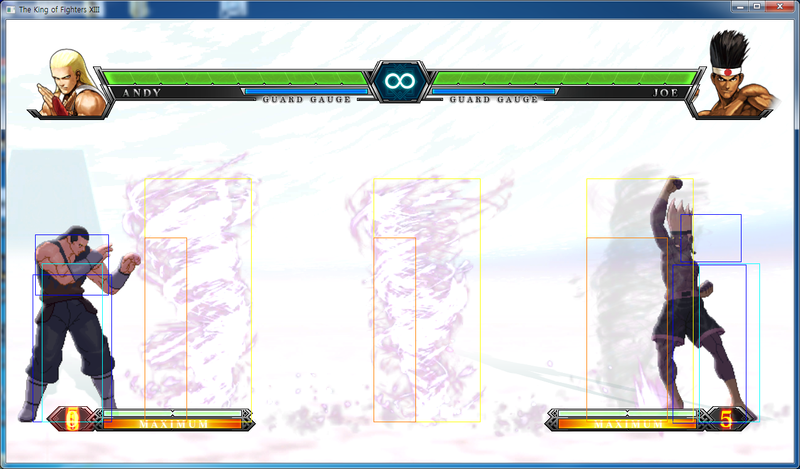 Drive canceling with Ougon no Kakato is an effective way of extending combos. Golden Heel = (qcb+K) - A jumping axe kick. B hits higher, has less range and doesn't combo off of normals. B is good for controlling the air, but is punishable. Leaves opponents juggle-able when hit while airborne. D combos off of normals and f.B, and much safer on guard. Can be used to chase A Hurricane Upper. D also juggles jumping opponents. (EX) = qcb+BD - Frame advantage on block. Follow-ups such as s.A, Bakuresuken, Bakuretsu Hurricane Tiger Kakato can be used on hit. Screw Upper = (qcfx2+P) - Creates a large hurricane just in front of Joe. Can combo off of strong normals. (EX) = qcfx2+AC Travels to the edge of the screen eliminating fireballs in its path. Hits the opponent sending them high into the air (lock-on hit type). Damage received upon landing. Fast start up, can combo off of weak attacks. Extremely punishable if blocked or whiffed. Hurricane Tiger Heel (Bakuretsu Hurricane Tiger Kakato aka BHTK) = (qcf hcb+P) - A ranbu style attack performing Bakuretsuken > Hurricane Upper > Tiger Kick > Ougon no Kakato. Can combo off of weak normals. Punishable when blocked. Screw Straight = (qcfx2+BD) - Horizontal version of Screw Upper. Can be used to punish fireballs. Can combo off of strong normals. Great for chipping as the opponent cannot guard cancel roll until the end of the move (does @100 chip damage). - (Corner) cr. B(x2), st. A, f+B, hcf+B, [A](1~3 hits), qcb+P, j. D = 289 damage (341 damage starting with j. D) - the first three light attacks must be spaced out, so Joe can connect hcf+B into [A] (1~3 hits)without using drive. - (Corner) cr. B(x2), st. A, f+B, hcf+B, dp+BD = 333 damage (382 damage starting with j.D) - the first three light attacks must be spaced out, so Joe can connect hcf+B into dp+BD without using drive. It should be important to learn Joe's midscreen and corner HD combos. Midscreen, he's capable of doing 60% without using any meter to speak of and can make people respect your space when you have full meter. Joe's basic frame trap is timing a slash kick so that you're farther away and you're safe on block. You can time it after a Hurricane upper to keep people from jumping or rolling through the fireball. This sets you up for a knockdown and crossup possibility. Also note, his fireballs are fairly tricky. You can hop over them, but not many people are aware of it. The different speeds though make it a bit more difficult to react to. His EX fireball is great fore mid range pressure as it eats most EX fireballs in a fireball war. A well-spaced Golden Heel can be safe on block, but it's still fairly safe except for command throws. You can use D Golden Heel to apply pressure, but it's always best to space it and be at a distance to keep applying pressure than to forfeit pressure completely at the end of a special. NOTE: The opponent must be blocking. Bakuretsu punch is safe on block if the minimal amount of presses (4 punches) was pressed. It's a nice tool to bait out a GC roll because of how safe it is. Inversely, you should be aware that st.C, f+B string can be guard rolled so being aware of someone who is prone to do that is important. Far D is a nice neutral poke that's meaty as well as long range. You can also delay the f+B after a hit to set up a small trap for someone to fall into and confirm into a special for safety. This could make people weary of throwing out specials or guard cancel rolling the Far D.
1. st. A > cl. C - 4 frame gap between st. A and cl. C.
2. st. A > cr. C - 4 frame gap between st. A and cr. C.
3. cr. A > cl. C - 3 frame gap between cr. A and cl. C.
4. cr. A > cr. C - 3 frame gap between cr. A and cr. C.
5. cl. A/C(x4, canceled immediately) > cl. C (L) - 3 frame gap between A/C(x4, canceled immediately) and cl. C.
6. cl. A/C(x4, canceled immediately) > cr. C (L) - 3 frame gap between A/C(x4, canceled immediately) and cr. C.
7. cl. A/C(x4, canceled immediately) > st. A (L) - 3 frame gap between A/C(x4, canceled immediately) and st. A. This page was last edited on 15 December 2014, at 19:54.